You've got your Maypole and now you need some music and some ideas about the dance. 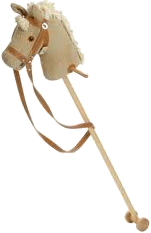 If you are really industrious, you can make a Hobby Horse. Of course, it does not have to be a horse but can be any animal (or "beast") you can dream up. Your beast can be as simple as a head fastened to a broom handle with a wheel at the other end. The dancer stands astride of the broom handle. A more stylised version has the dancer holding up the broom handle beneath a skirt of material attached to the broom just below the head which covers them completely. In the most complex constructions the dancer appears to be astride the animal. In the more elaborate versions, it has become the tradition to articulate the mouth of the beast so that it can snap its jaws in time with the music. 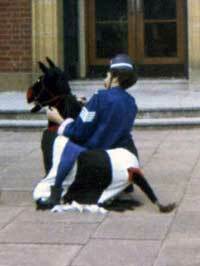 Some believe that the hobby horse's job is to link the audience more closely with the dancers' performance by moving seamlessly from the performance of the dance to being among the watchers. Others suggest that it is another way to create mischief and excitement. The Green Man is another disguised character. His history dates back a very long way and his head, with leaves coming out of his mouth, can often be seen staring down from the tops of columns in old churches. Like the other disguised characters, he can be a source of good or mischief. 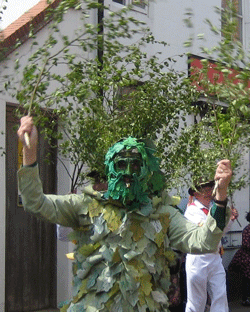 You can make your own Green Man character in a variety of ways. 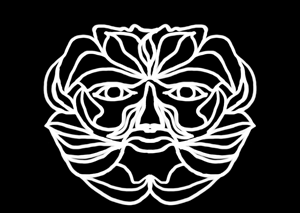 If you have a face-painter they can design their own faces or you can download the template by clicking on the image on the right and paint your own face, then cut it out and attach elastic to make a mask. Of course, you can also make a full outfit like the one in the picture. It was the tradition in many villages and towns to crown a May Queen. The picture shown is of the 2013 Lichfield (Greenhill) Bower Queen. The selected person is crowned shortly after the start of the Bower Procession and then processes through the city on the back of a flat-bed truck. The queen and "attendants" are given gifts to mark their appointment and attend various official engagements during the subsequent year.